She moved from commercial banking into the international development world. 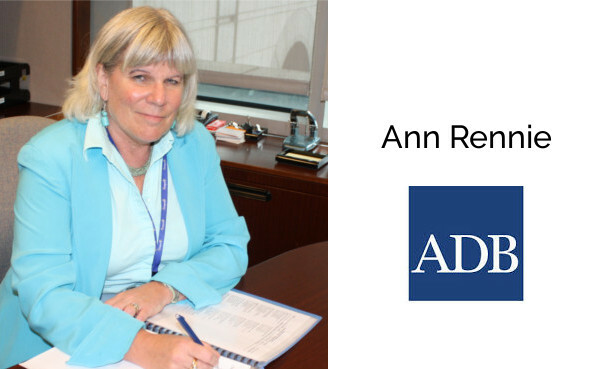 In this episode we talk to Ann Rennie, responsible for human resources and one of the Deputy Director Generals for the Asian Development Bank (ADB). “I kind of fell into banking, but then I always was missing something. There was something that wasn’t there”, says Ann Rennie. The role of ADB and how do you build a career at the bank, i.e. Young professional program and internship. Organizational culture in international financial institutions compared to private sector organizations. Ann’s proudest career moments and her lessons for a successful career. On working in Asia: “When you have a typhoon come through, even if you’re not working on that in operational terms as a project, you get involved anyway. You go off and you work on the food baskets and pack people’s trucks with them and help people. You’re living that life of helping and improving people’s lives. You’re right here”, says Ann Rennie. If you enjoyed this episode, please share it and don't miss to read our member's article describing ideas how to transfer from private sector into the development sector! Also, please leave an honest review for the Impactpool Career Podcast on iTunes! Ratings and reviews are extremely helpful and greatly appreciated! They do matter in the rankings of the show, and we read them all. Ann, thank you again for being such a great guest!